The End Times Passover: G.A.Y.S. (Goyim Against Yielding Shellfish) Claim They Will Fight Discrimination by Fin and Scale Group. G.A.Y.S. (Goyim Against Yielding Shellfish) Claim They Will Fight Discrimination by Fin and Scale Group. Goyim Against Yielding Shellfish (G.A.Y.S. ), a newly formed organization which claims it is fed up with people who criticize, condemn, attack and vilify people who enjoy eating shellfish such as oysters, shrimp, lobsters, crab and other crustacean delicacies, is planning to fight back. "Enough is enough! This type of discrimination has gone on long enough. Therefore, we are organizing groups throughout the world to unite us G.A.Y.S. to actively fight this demented form of racism, claims a group spokesperson. "We will be aiming our efforts primarily against those pious chosen Middle Easterners who not only keep trying to defame us by calling our penchant for shellfish as one of the worst sins in the world, they now want us to yield all the shellfish we have in our freezers, as well as clam chowder and lobster bisque recipes we have acquired throughout the years. "More importantly," said their chief spokesperson, "we are tired of them quoting from their foolish Bible, especially Leviticus 11:9-12." “These you may eat, of all that are in the waters. Everything in the waters that has fins and scales, whether in the seas or in the rivers, you may eat. But anything in the seas or the rivers that has not fins and scales, of the swarming creatures in the waters and of the living creatures that are in the waters, is detestable to you. You shall regard them as detestable; you shall not eat any of their flesh, and you shall detest their carcasses. Everything in the waters that has not fins and scales is detestable to you." The G.A.Y.S. believe that outmoded caveat may have been applicable to those people in those days simply because they did not have refrigerators. But, with new technologies, where people can freeze shellfish for long periods of time, the G.A.Y.S. 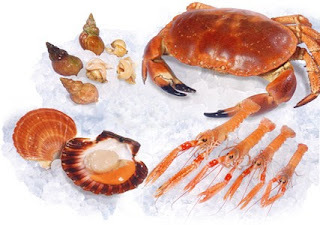 feel they have developed the sophistication to clean, preserve and keep shellfish cool enough to prevent any spoilage. "This form or discrimination has become the most mean-spirited way of degrading people who enjoy their crabs and lobsters (especially with drawn butter), "said Charlie Tuna, the newly appointed spokesperson for G.A.Y.S., who recently defected the camp of those fishers of men known as the Fins and Scales), the premier group of seafood promoters in the world. Most G.A.Y.S. used to believe that the only healthy foods from the sea were tuna, sea bass and salmon, based on the unchallenged educational standards they experienced since grade school, but found themselves returning to shellfish, regardless. However, new scientific studies have proven that shellfish aficionados have never had any real choice in the matter because they actually acquired a natural affinity for mollusks and have been drawn to them since birth." "Enough is enough, "said Tuna, who added that the Fin and Scales groups want to eliminate any kind of shellfish they believe could compete with the star logo they have used as their 'secret" symbol to deflect any scrutiny for their old fashion values system since they were formed over two thousand years ago. Tuna stated G.A.Y.S. 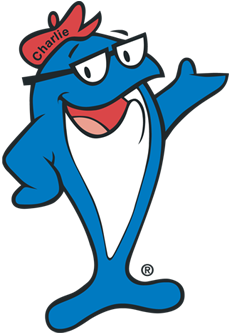 are in contact with the ACLU and plan to develop and implement curriculum in grammar and high schools to teach young kids to be more sensitive to the needs of shellfish lovers and that they cannot demean members of G.A.Y.S., and to also learn how to appreciate and enjoy shellfish anytime, anywhere, they so choose." Tuna added they plan to push their agenda all the way to the Supreme Court and hopefully one day society will make it mandatory that all humans must eat shellfish at least one a week. He added they are also working on holding "We Love Shellfish" parades throughout the USA.